Sober Look: Eurozone's falling excess reserves - is another round of LTRO required? 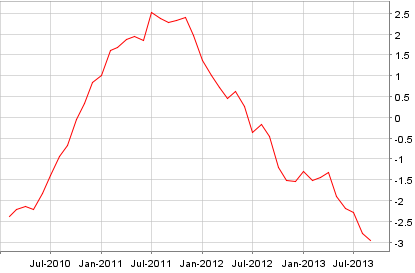 Eurozone's falling excess reserves - is another round of LTRO required? The euro area banking system excess reserves are continuing to decline - touching the lowest level since 2011. Just to put this in perspective, the chart below shows excess reserves in the US. With the Fed continuing to pump liquidity into the system, these swelled above $2.3 trillion last week - a new record. The reason the Eurozone reserves are declining has to do with the area's banks gradually repaying what they have borrowed from the Eurosystem via MRO and LTRO loans. 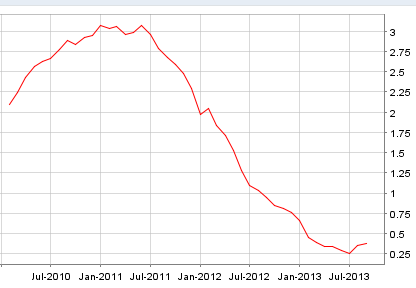 Some economists view this decline in excess reserves as an indication of tighter monetary conditions in the Eurozone. They point to weak consumer credit growth and a severe contraction in corporate lending. A few economists have called for Mario Draghi to offer up another round of LTRO lending or lower the rates on MRO (short-term) loans in order to boost excess reserves. The thought is for the ECB to follow the Fed's and the BOJ's lead at the October meeting and expand its balance sheet. Such action however is unlikely at the next meeting. Certainly if these declining excess reserves push up rates, the ECB will have to act. But the central bank does not have the Fed's dual mandate and is not as focused on the Eurozone's dangerously high unemployment levels. Instead Draghi will concentrate on forward guidance of maintaining low overnight rates for the foreseeable future. The ECB will want to keep the LTRO tool in its back-pocket in case the crisis flares up again. After all, there is a nonzero risk of the German Constitutional Court ruling against the OMT program (ECB's commitment to directly purchase government bonds of periphery nations). 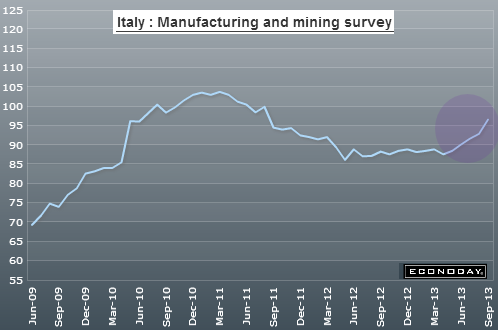 Other issues, such as political uncertainty in Italy (see post), could potentially reignite the crisis as well. For now Draghi will want to see if the Eurozone's credit markets can begin to "heal" themselves. The members of the Governing Council are following a number of business surveys which seem to point to stabilization in the area periphery nations. If however lending volumes do not show a visible improvement in the next few months, another LTRO program could be in the works at a later date. Bloomberg: - Frederik Ducrozet, an economist at Credit Agricole CIB in Paris says an LTRO is unlikely until December. The central bank could boost its forward guidance by putting a definite end date for loans at a particular cost, by issuing an LTRO with a fixed rate, he said. The previous loans were charged at the average of the ECB benchmark over the maturity. ‘‘A properly-designed LTRO would have the potential to kill several birds with one stone by enhancing forward guidance, keeping excess liquidity higher for longer, and further boosting the use of collateral from small businesses,’’ Ducrozet said. ECB officials including Executive Board member Benoit Coeure have played down the short-term likelihood of a new round of long-term loans, saying that while it remained an option, it hasn’t been specifically discussed. The ECB’s Governing Council convenes in Paris on Oct. 2 for its monthly rate-setting meeting.